So when one of my brothers recently exhumed the scanned photograph of a stately Victorian home and its occupants from the filesystem of my 94-year-old father's computer, I initially drew a blank. 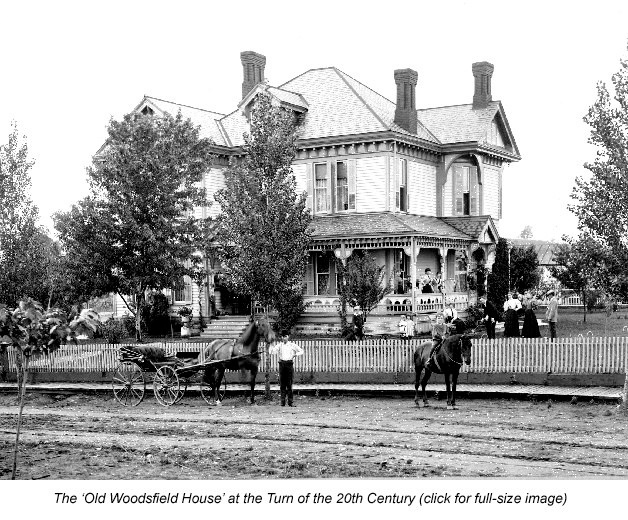 The scan bore the digital filename “Old Woodsfield House.” The lack of electrical wires, the dirt road, the presence of a horse-and-buggy and the clothing all suggested the photo was made around the turn of the Twentieth Century. It’s not just the house that makes the image compelling—although it is quite attractive and rather grand—but also its proud residents staged so elaborately about the yard and along the road in front of the structure. On the front porch, two stylish young women look over the rail onto the lawn below while another, older woman, more demurely attired, observes from behind them. The object of their attention is a croquet game in progress. A man holds a mallet, positioned to strike, while two women and a second man await their turns. A sixth woman sits on the porch steps, also looking on. To the left of the croquet players, standing at ground level near the corner of the porch, two little girls, dressed in their Sunday best, stare directly into the camera. A somewhat older boy with a frilly collar and a not-quite-grown-up skimmer of a hat stands alone, a safe distance from the girls (his sisters, perhaps? ), and also eyes the photographer. Another boy sits atop a horse in the road, while a young man—maybe a groom or some other servant because he is dressed more plainly than the other male figures—stands with one hand on his hip and the other holding the bridle of the horse attached to the buggy. My mother occasionally mentioned spending summers during the 1920s and 1930s with her mother’s family in Ohio. My maternal grandmother, whose maiden name was Mallory, lived in Ohio as a child, then relocated after her marriage to upstate New York. So my brother guessed the “Old Woodsfield House” had once been owned by the Mallory family. My grandmother lived from 1891 to 1975, so my guess that the photograph was made around the turn of the century was consistent with my aunt’s understanding that the house was constructed “when Mother was very little.” If my grandmother is indeed the younger of the two little girls posed next to the porch, the house would have been only a year or two old at the time. It’s pure conjecture, of course, but one can easily imagine an enterprising photographer knocking on the doors of the grandest new homes in Woodsfield with a proposal to stage an elaborate family tableau. Or maybe my great-grandfather commissioned the photo to memorialize the completion of construction. Was the structure in the photograph still standing? What did it look like after all these years and, no doubt, many alterations? Though curious, I wasn’t particularly keen on hopping in my car and driving more than 300 miles from my home in Washington, D.C., to Eastern Ohio to comb the streets of Woodsfield looking for a house that might have been torn down decades before. I made a print of the scan and brought it to work to show to a colleague who had been researching his family’s history, thinking he might have some suggestions. He told me many local historical societies around the country had set up websites, and suggested I try a Google search. It took me only a few minutes to track down the site of the Monroe County, Ohio, Historical Society and not much more than that to find the electronic mail address for one of its maintainers—who, by coincidence, turned out to live not far from me in a Washington suburb. “Since I am not from Monroe County,” he responded, “I am not all that familiar with the houses in Woodsfield.” However, he forwarded my inquiry to a group of “the most qualified people I know . . . to answer your questions. . . . I should add that while the addressees are experts in the area and are nice people, they are busy people and not researchers. I hope you get the information you need.” I decided to take the hint and wait patiently to see if I received any responses. In the meantime, without saying anything to me, my colleague had begun a painstaking street-by-street search of Woodsfield using the “street view” feature of Google Maps, which offers panoramic photographs of thousands of locations in the United States and several other countries made by Google’s fleet of roving camera vehicles. After arriving at work the next morning, he asked me to follow him into his office and look over his shoulder at his computer monitor. He tapped a URL on the keyboard and suddenly I was looking at my grandmother’s house as it appears today. The front porch of the house in the Google image was different, and there were fewer chimneys than in the turn-of-the-century photograph, but the roof line and windows seemed to match. The house appeared to be on a corner lot on Woodsfield’s Eastern Avenue. However, the Google Maps viewer firmly planted the house on Eastern Avenue in Woodsfield, albeit warning that its automatically-generated street address was only approximate. So I sent a follow-up note to the electronic mailing list of Ohio experts, attaching a computer screen capture of the Google street view, and asked if any of them recognized the current image of the structure. 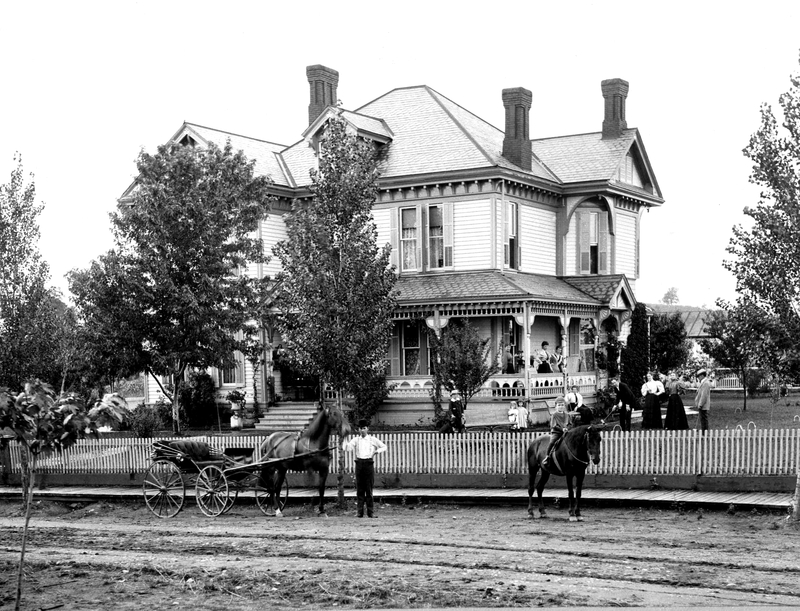 Although by now I had determined the location of the house, and its survival into the Twenty-First Century, my initial query was still reverberating among the recipients of the electronic mail distribution list—and had spontaneously morphed into a broader inquiry into the Mallory family, to which several of the Monroe County experts were related. One of the Ohio sleuths whose family was related to the Mallorys forwarded summaries of my grandmother’s family history collected from various websites—much more about the clan, I suspect, than my mother or aunt ever knew—as well as a 1902 extended family photograph that included my grandmother and links I could use to find more detailed information. I actually did follow a few of the links to Internet resources describing the many branches of the Mallory family. It’s easy to see why so many people get hooked on genealogical research. While I don’t think I’m about to joint their ranks, I confess I was surprised to discover I may be descended from Peter Mallory (1614-1698), who signed the 1644 Planters’ Covenant in the New Haven Colony, a pre-revolutionary heritage to which I hitherto had never aspired. Not only that, but I probably am collaterally related to Sir Isaac Newton (yes, that one) through Harriet Newton (1791-1868), who married my great-great-great-grandfather, Jasper Mallory, Jr. (1784-1864). To which let every one ascribe the faith and merit he chooses.